Thanks Lance for everything you brought to Houston, and to the game. You're truly one of the "good guys" and deserve every accolade given to you. Thanks for the memories and I can't wait for the Astros to retire your number. Panini, this is how you do an unlicensed product. Stop making it glaringly obvious that you don't have a license! Brilliant! Double swatch? Check. Decent photo of the player in uniform? Check. No large blank area where a logo should be? Check. And nicely low numbered as well! 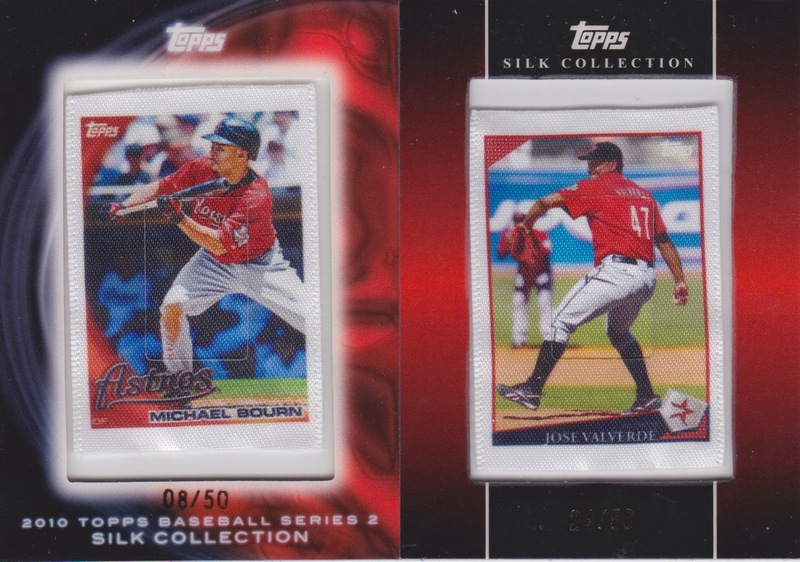 I have the /25 version headed my way. I was slated to get a /10 laundy tag version, but the guy I had set up to bid for me fell asleep in his recliner and missed the auction. Can't blame him, he was bidding for me because I was already in bed! Ha! Needless to say, I like this effort from Panini. Really can't wait for them to get a license again because I really think they can do some great work. Snagged this card on eBay a few days back, got it in the mail the other day and thought I'd show it off! 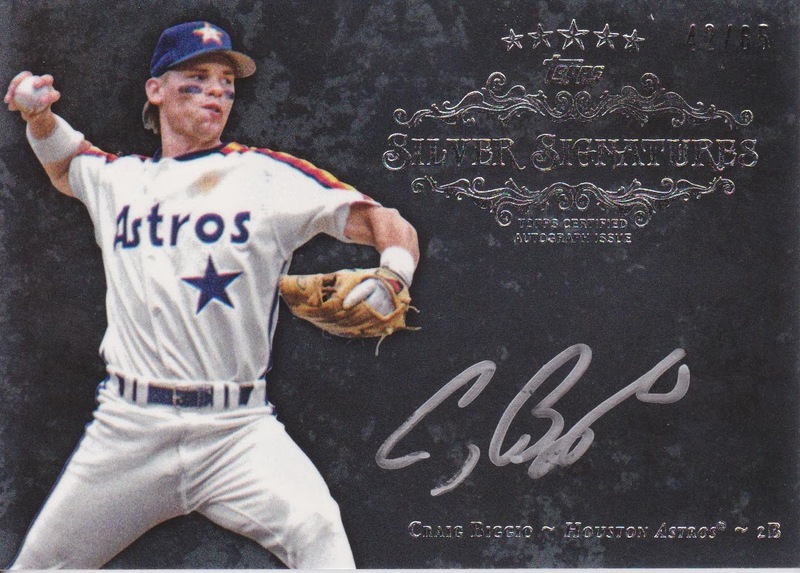 This beaut comes from 2002 Topps Chrome and is just beautiful!!!! 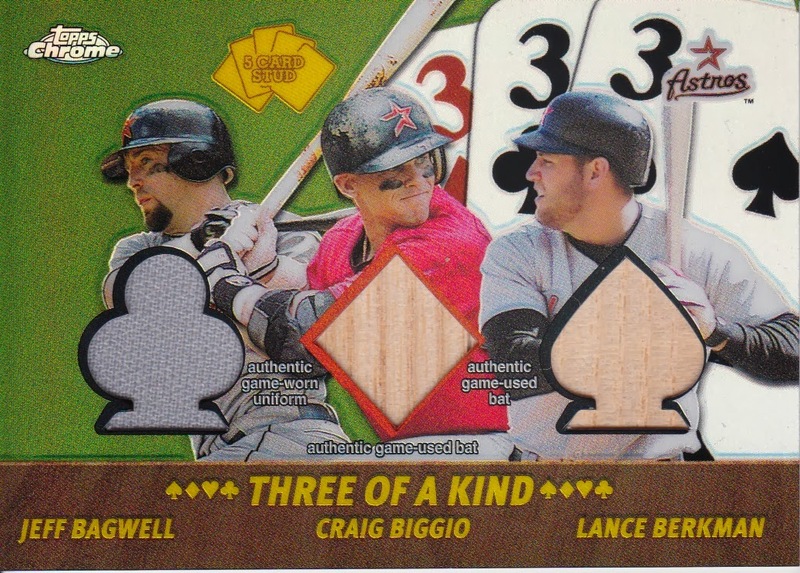 Not too many times you find a card with all three of these guys on it! 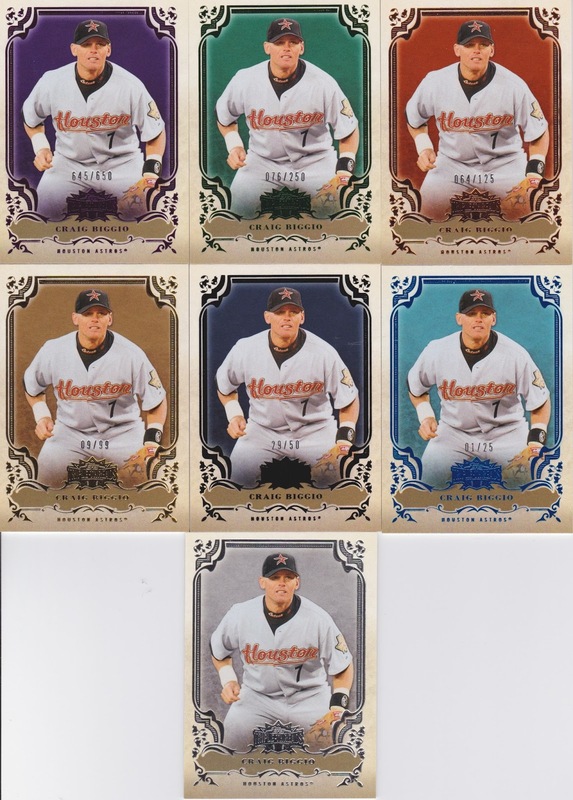 Some nice Astros there for sure, not sure why Just Minors pulled the full Panini treatment on that Paulino, but whatever. That Bagwell sure scanned nicely! Alright, onto the meat of the deal... Greg pulled a couple Hollywood cards out and I snagged them for my wife's collection! A piece of Jacket worn by Woody Harrelson in Kingpin! 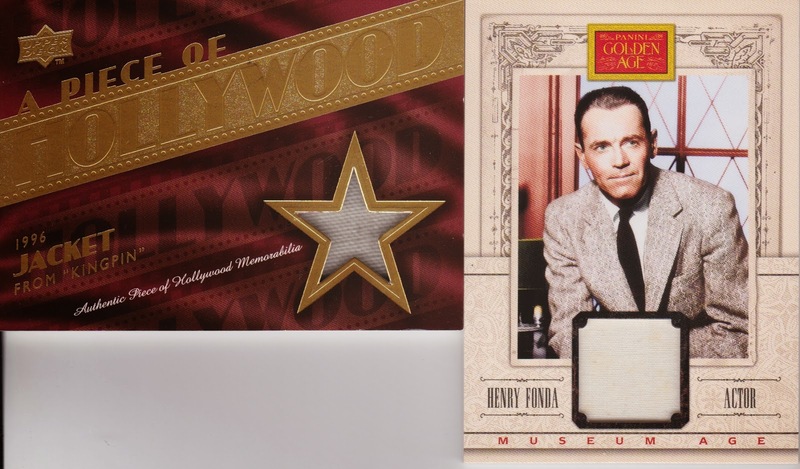 And a Henry Fonda relic, both fit nicely into the wife's collection! Anyone with spare Hollywood hits, let me know, the wife is always looking to add to her collection! Will trade baseball for Hollywood any day! 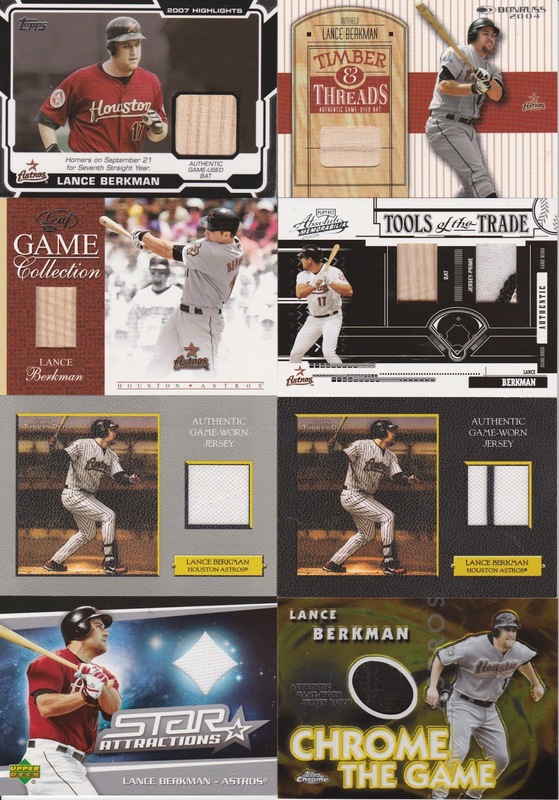 Finally, some baseball cards round out the deal! Lance is on the verge of retirement, and what a career. Was he a HOF'er? Doubtful, but he had a career that any aspiring player would love to have. 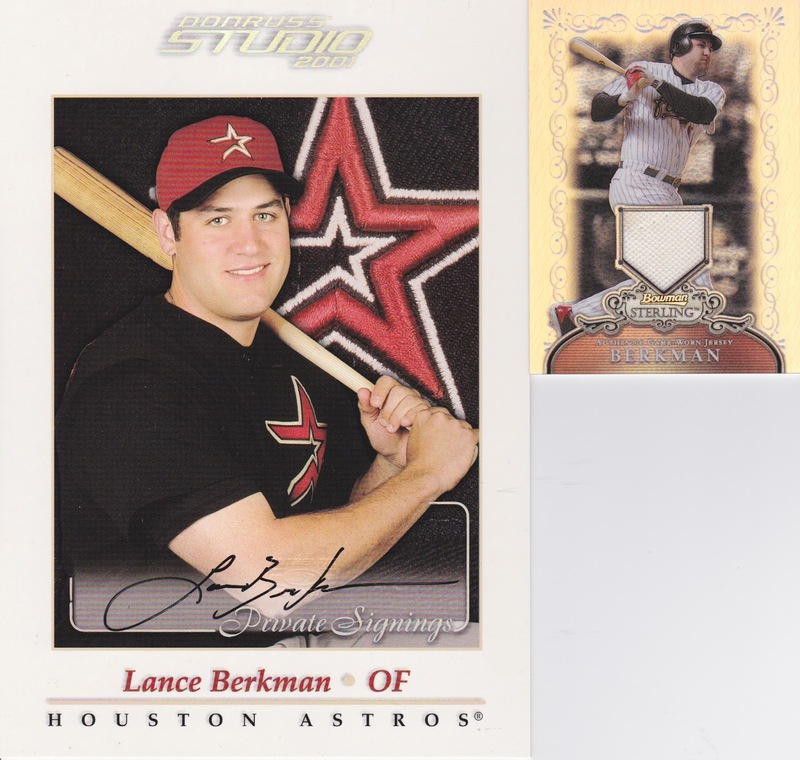 First up is a sweeeeeeet Lance auto from his minor league days as a Jackson General. Next, the Leaf Limited /100. That's a nice patch on the lower right! Finally, a minor leaguer who can certainly mash HR's, but K's a LOT. 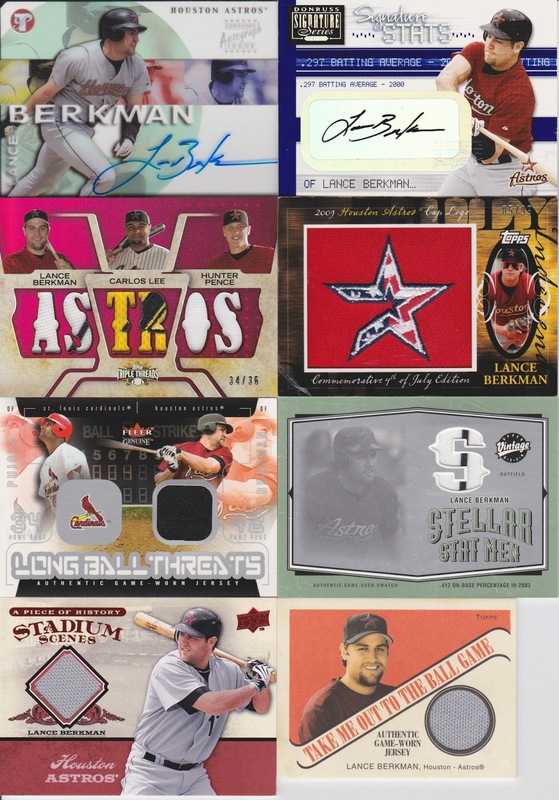 Don't know if Mr. Nash will ever make it to Minute Maid Park but I like his auto for sure. 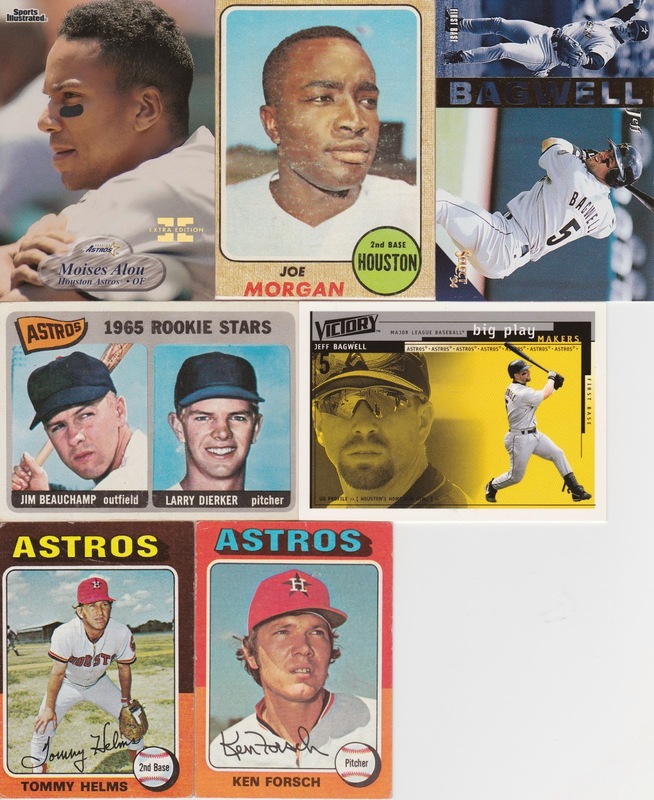 The Green parallel /399 is pretty nice as well! Yep, that's the 1/1!!!!! Freakin sweeet! So that leaves me with the /10, /50 and base /99. 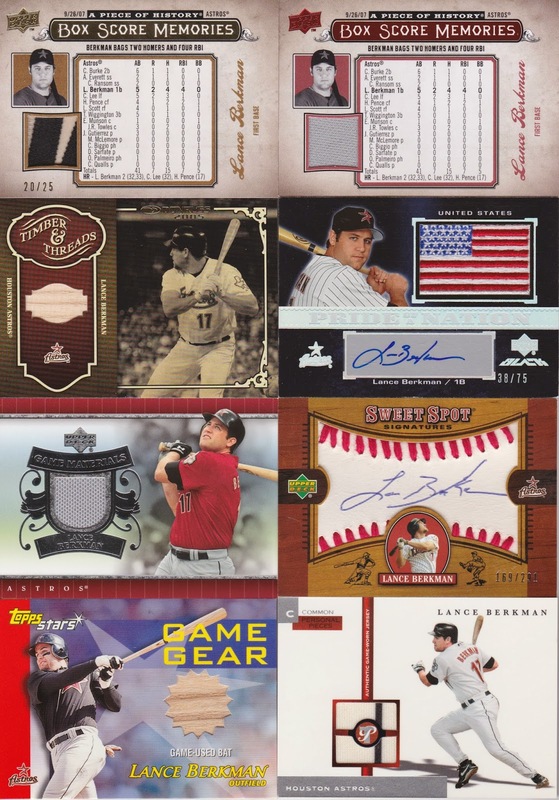 There is one of the /10's on eBay right now, but it's a BIN and definitely more $$$ than I paid for the 1/1. Hopefully another one pops up before I'm forced to buy it! Ha! 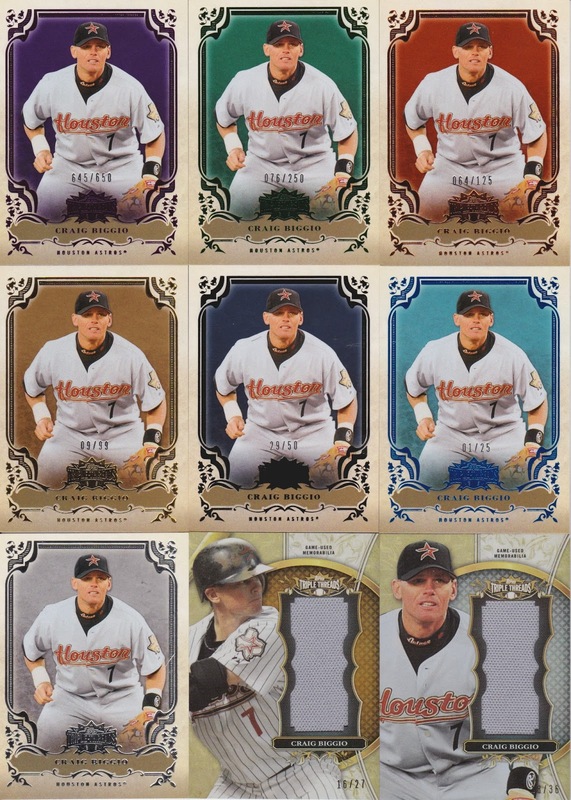 If I ever see the 1/1 of the UAJR-JM1 pop up on eBay, I may be tempted to snag it and go after a rainbow of that card as well.... you know what that means, I'd have a DOUBLE RAINBOW!!!! Hahahaha! Have a great weekend everyone! Topps and Panini each sent me a package the other day. 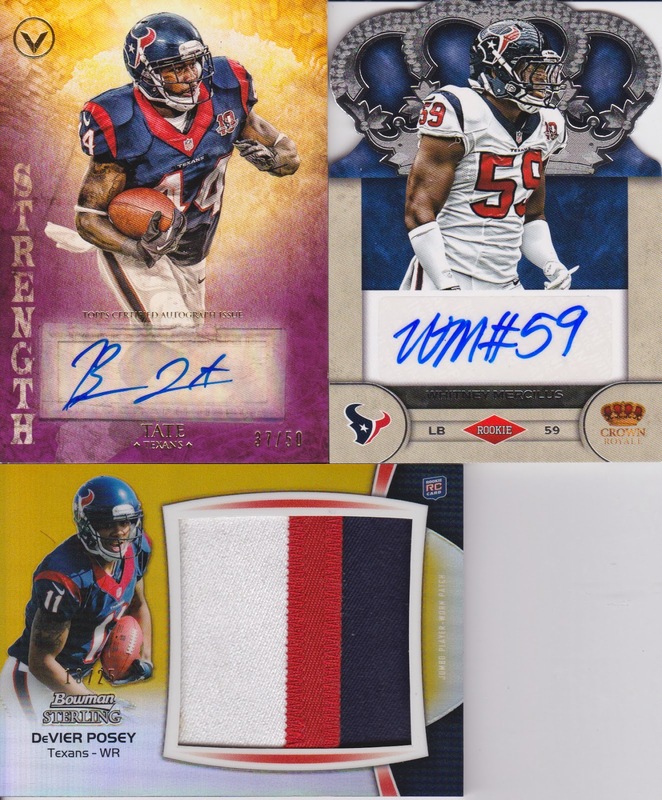 Both were redemptions I had been waiting on for some time! The foil board name didn't scan, but that's Rio Ruiz and what an awesome signature! 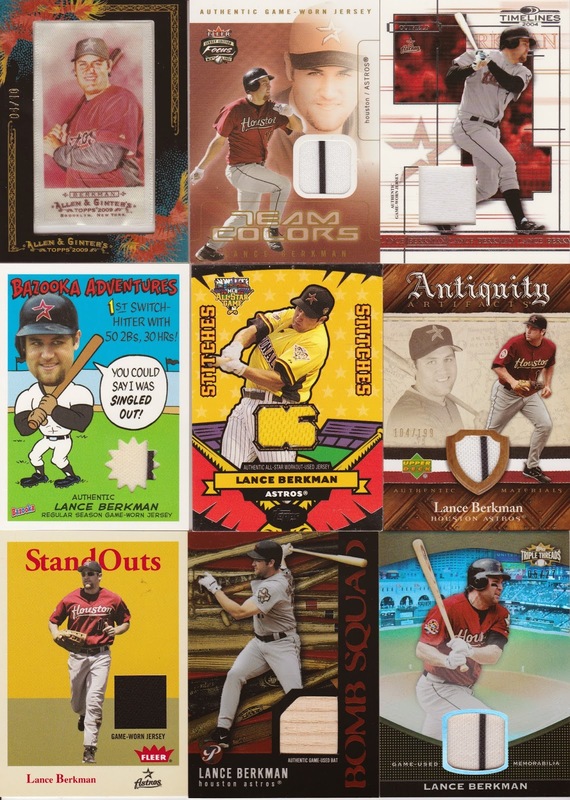 Despite my better judgement, I have to give this one to Topps. 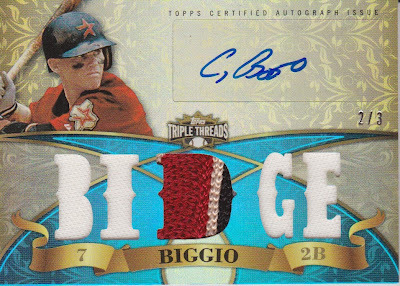 On-card auto, logos and a decent design trump Biggio's card. I know sticker autos are part of the business now, we can't avoid them. 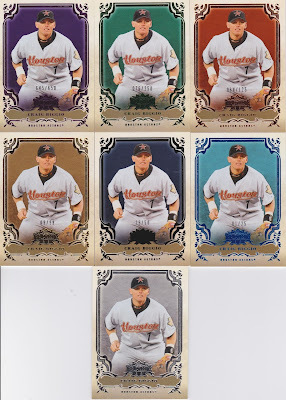 But I really feel that if I'm waiting for a redemption, it should be due to the company waiting on the hand-signed cards back from the player; not waiting for the company to have a guy place the stickers on the cards. Anyways, rant over, two great cards for my collection nonetheless! These two cards dovetail nicely together! One tells you what club he's in, the other tells you exactly how many hits he got! 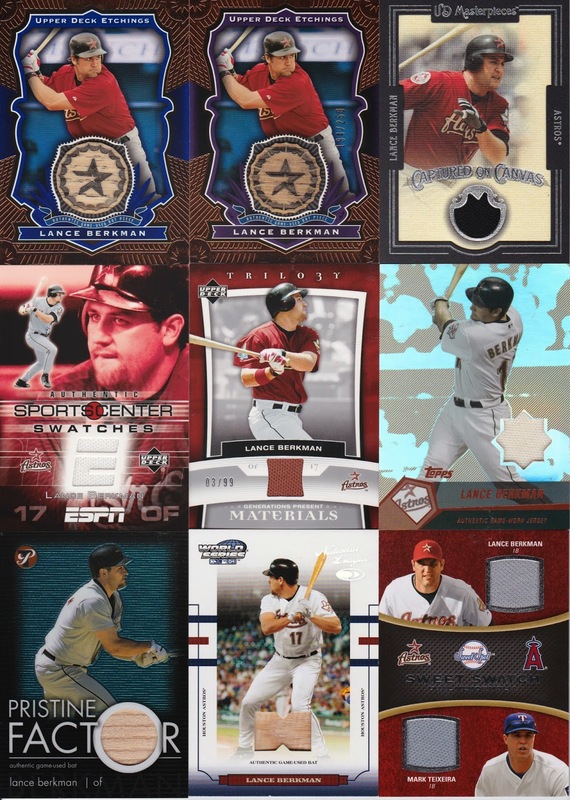 The Triple threads is out of /36 while the Panini is out of /125. Both great looking cards, even if there is no logo on his helmet in the Panini. 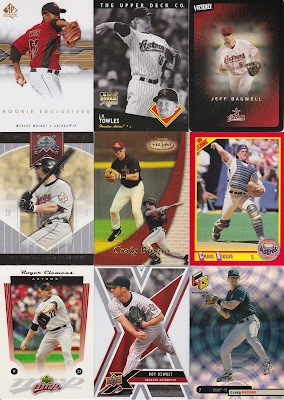 Panini is still a bit odd in their designs, something just is off to me and it's not the logos. It just seems like they are all designed in some 1994 version of Paint or Word with ClipArt. Anyone with me on this???? It didn't scan too great, but it's an awesome looking card. 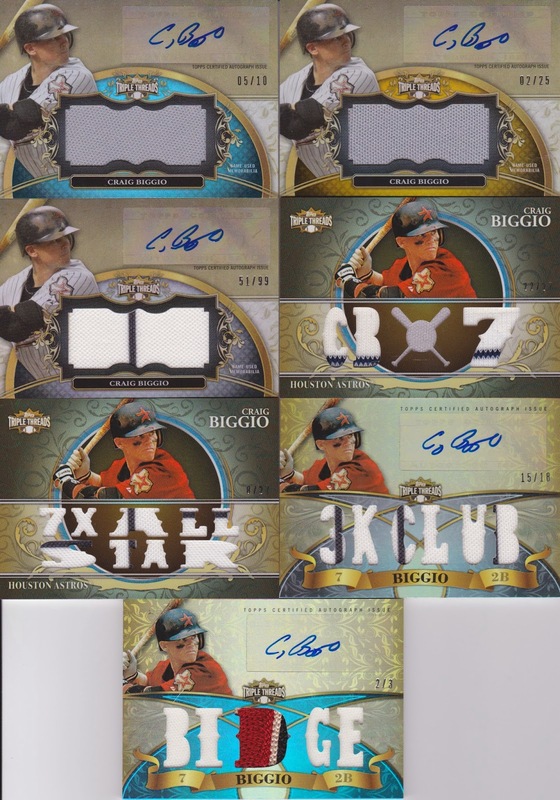 Outside of some crazy patched relics and dual autos, I think this may be the last Five Star Biggio I pick up unless I get extremely lucky on a misspelled auction for something crazy! Haha! Some of this may be repetitive, but I wanted to get all these Biggios in one post, and while I would have liked one scan, I just couldn't fit them all in the scanner at once!!! Wow, ok so that's a lot of shiny stuff! 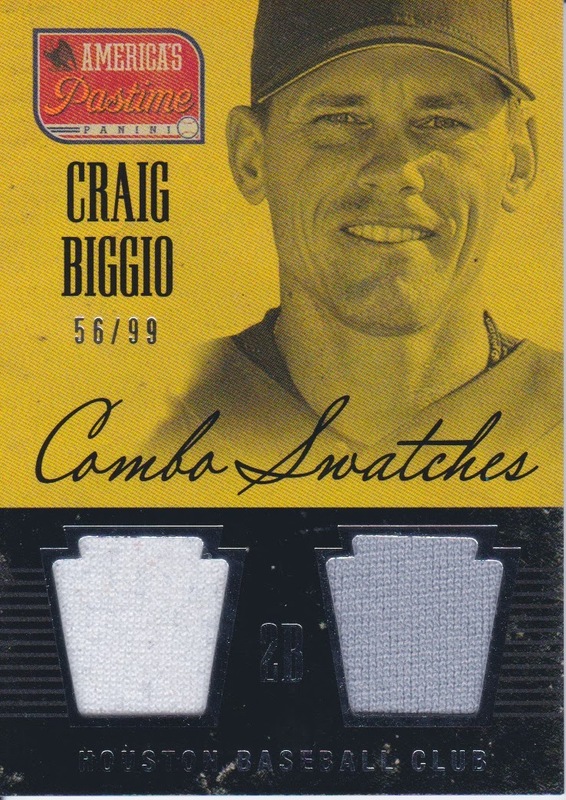 Relic - TTR-CBI1 - "3K CLUB"
That's 5 cards and I'll be satisfied with my 2013 chase of Biggio in Triple Threads. 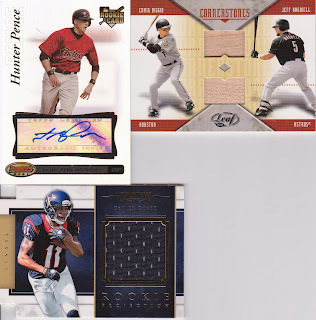 I figured the hardest to get a reasonable price will be the Triple Auto-Relic Combo redemption card. Fingers crossed! So my LCS had their monthly Trade Night last night. Had a BLAST! Opened some great stuff. I'll start with a couple of actual trades I ended up swinging while I was there. 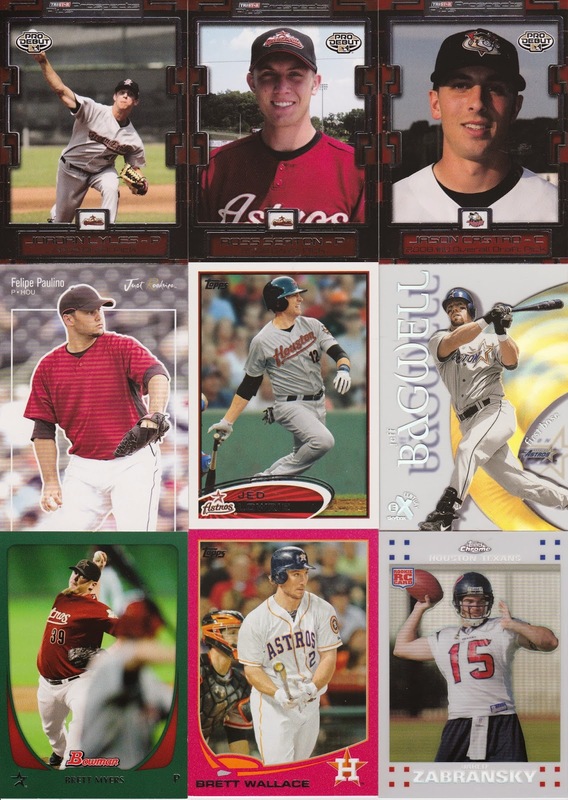 The Pence and Bagwell/Biggio below were coupled with an autographed Jonathan Singleton baseball bat! I have two cards that I pulled from Triple Threads last night that just blow my mind. I definitely think one is more awesome than the other... but I don't know which one to show off first.... I guess I'll start with an AWESOME BIGGIO!!!! 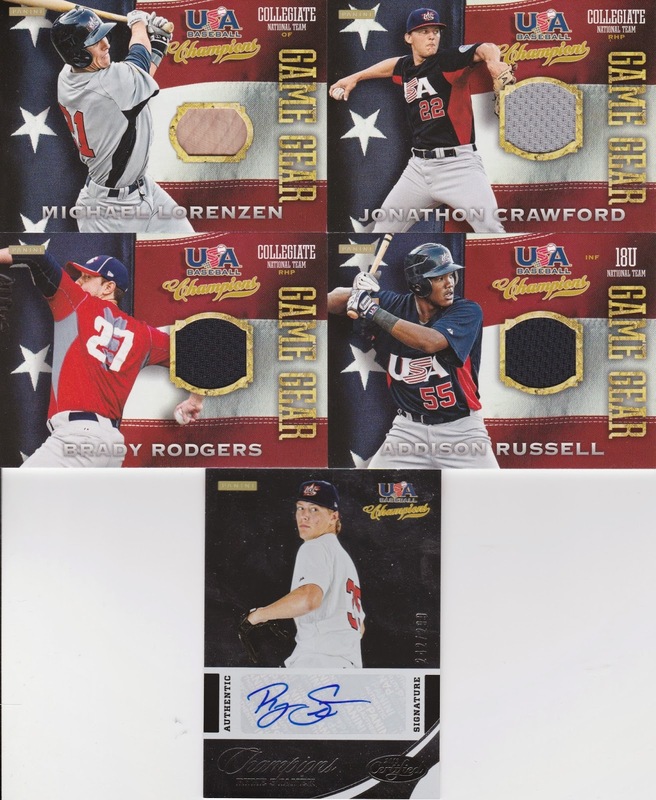 Yes, that IS numbered 2/3.... and has a SWEEEEEEEEEET PATCH!!!!! Always awesome to pull something that you actually collect! I couldn't believe it! 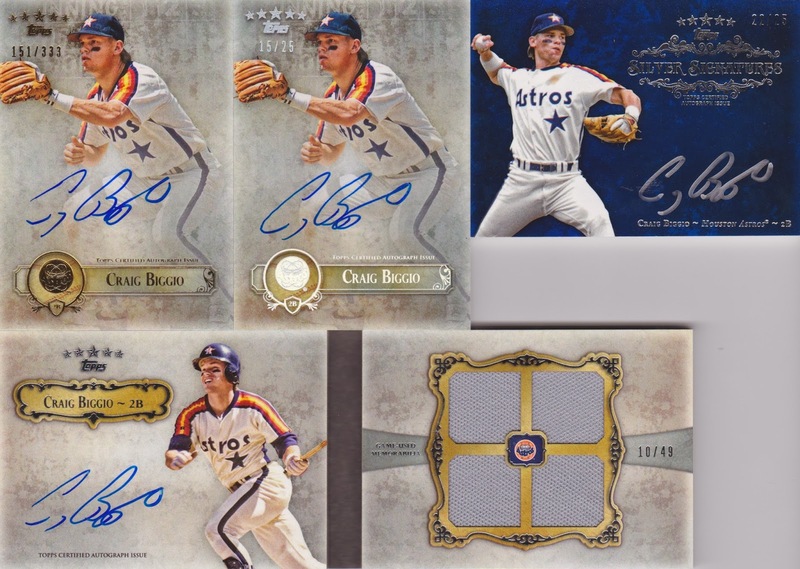 I was SOOO pumped when I slow rolled the reveal to see the Astros logo first, then the Biggio auto, then the 2/3 and finally the patch! There was a small round of applause in the shop (seriously, people applaud others big pulls, especially when it's something like this). It was great. The 1/3 sold on eBay already and the 3/3 is up for sale, but I can 100% say this is staying in my collection! 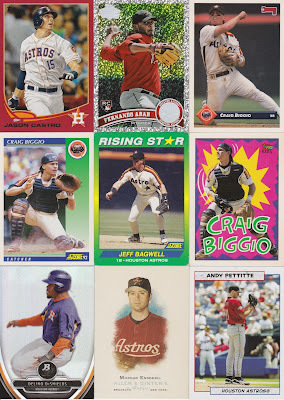 Great picture of Biggio, great looking card and it scanned pretty nicely. OK, so as awesome as that card is, you're probably wondering what could be close to as awesome. Well, I pulled my first BOOK CARD!!!! 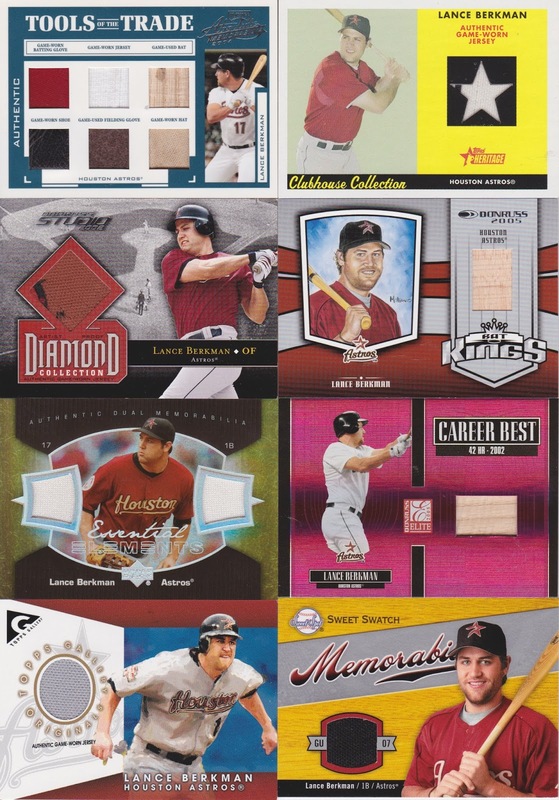 It was the last mini-box of Triple Threads that I opened (different master box from the Biggio though). I could tell once I pulled the foil wrappered pack out of the mini box that there was a book inside. It was ultra thick. 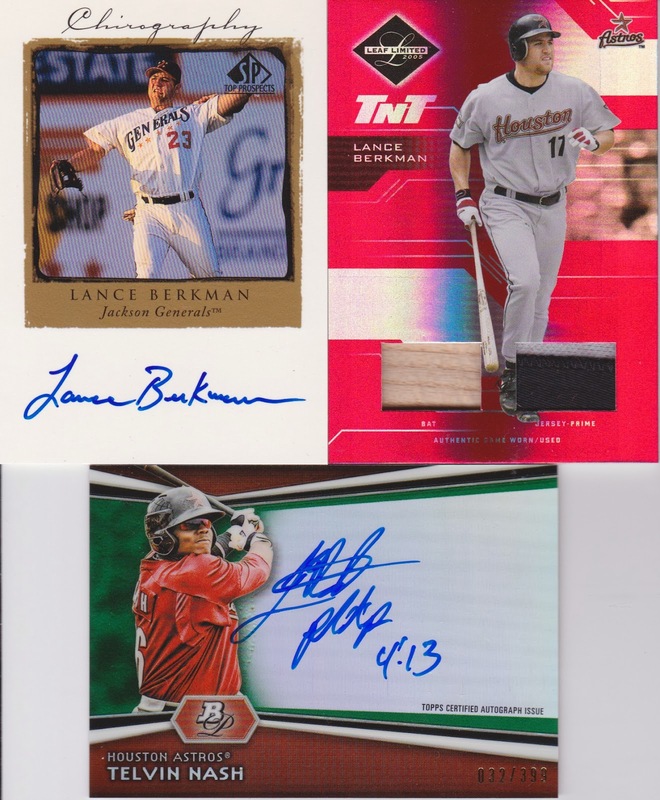 The autograph in the pack was Evan Longoria /99. Not bad at all. And then there was this! So here's the outside cover of the book! WOW!!!! 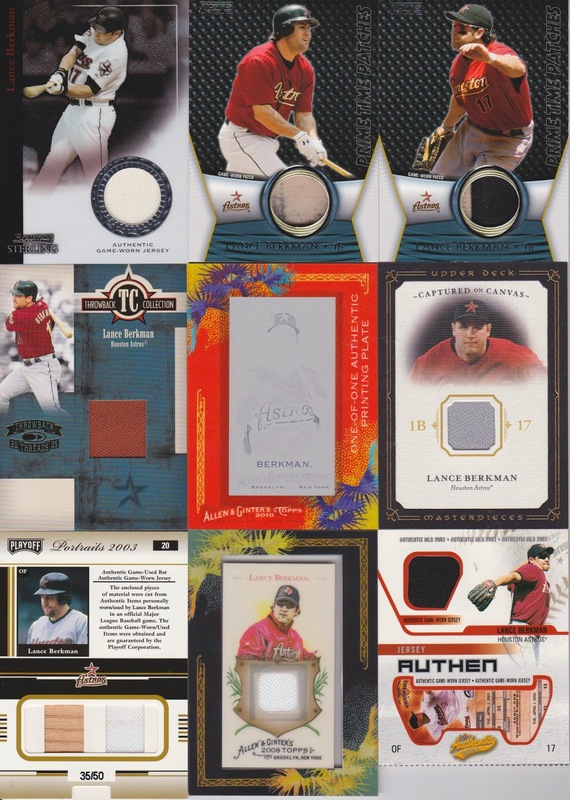 And the inside, the relics!!!! 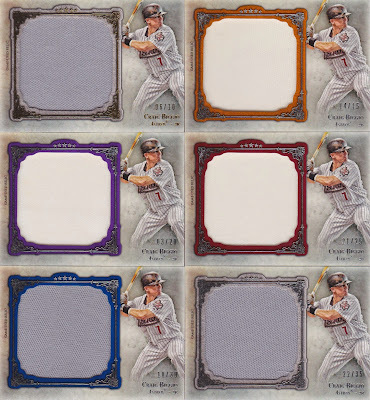 The A-Rod and Berra are patches. 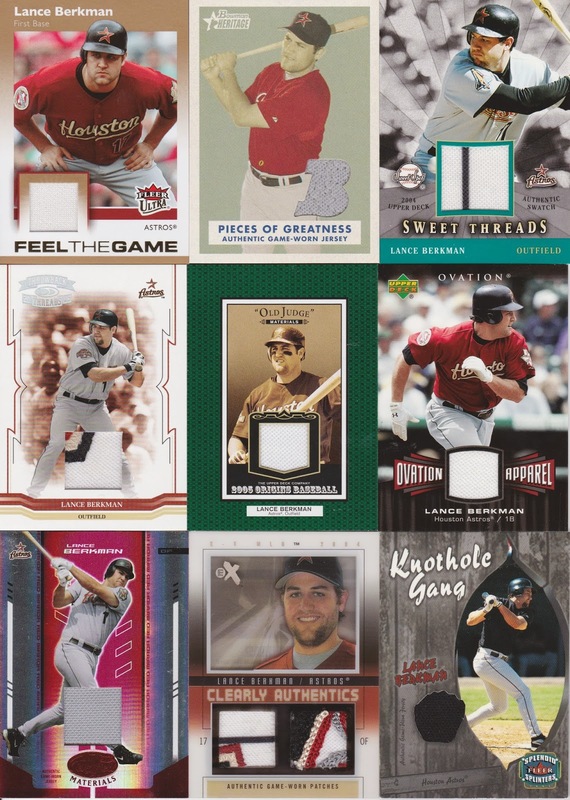 The card is numbered 2/9 (Jeter's number). 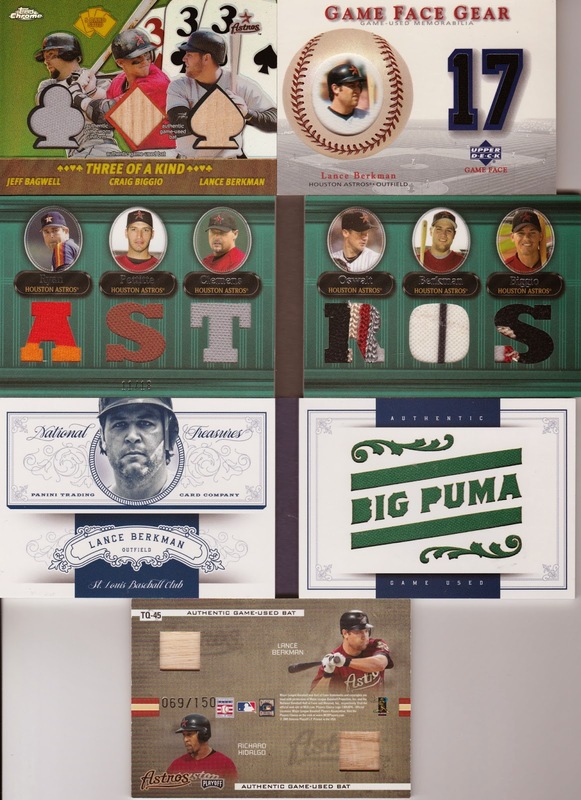 Honestly, a SWEEEEET card even if it does have A-Rod. I couldn't believe my luck! Great, great, great card to pull! There was another round of applause. This just capped off a great night! 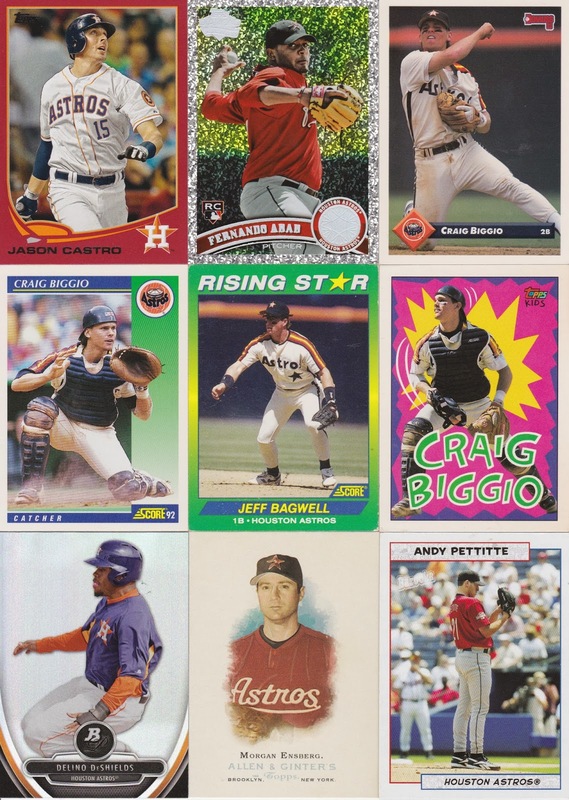 I was very excited to walk out the door with the Biggio, to add the Yankees book was just awesome. I haven't decided whether to keep this or sell it. I had a cash offer while we were in the store. I am no Yankees fan, but I admire Gehrig and to have a piece of bat of his alone is pretty cool. Maybe this is one I hold onto, since it's the first book I've ever pulled. Two of these guys may not be Texans next year (Posey and Tate). Tate is definitely gone, he'll get a fat free agent contract. Posey may not fit in O'Brien's system. Mercilus has enough potential to stick around in Romeo Crennel's 3-4 system. 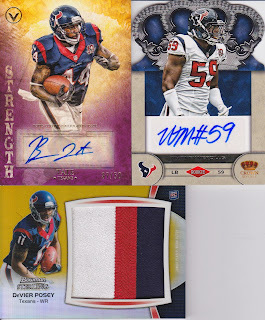 Texans are a team in transition but I think it'll be a quick turnaround! Secret Santa Elfster by Crackin' Wax - Team Phungo Comes Through! Paul over at Team Phungo runs one of the best Phillies blogs there is! He drew my name in the Elfster Secret Santa run by Crackin' Wax! 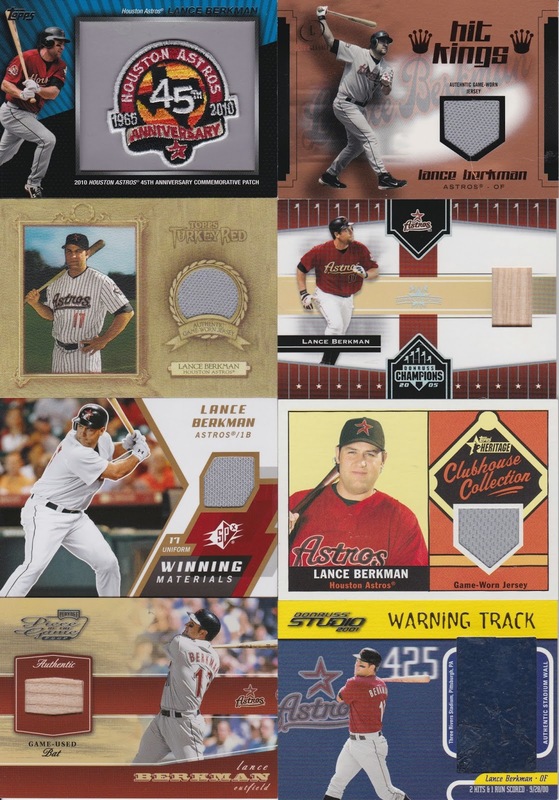 I was thrilled to open the package to find these Astros beauties... yes, you're getting a bunch of scans! And Night Owl, yes, EVEN the base cards! Gotta love some vintage there at the end! The Morgan, it looks like it was horribly miscut or someone tried to trim it for some reason, who knows? I love the Dierker and it's actually a better quality than the one I had, so it gets a binder page! Now for those of you who just want to see hits!!! Haha, kept you waiting! 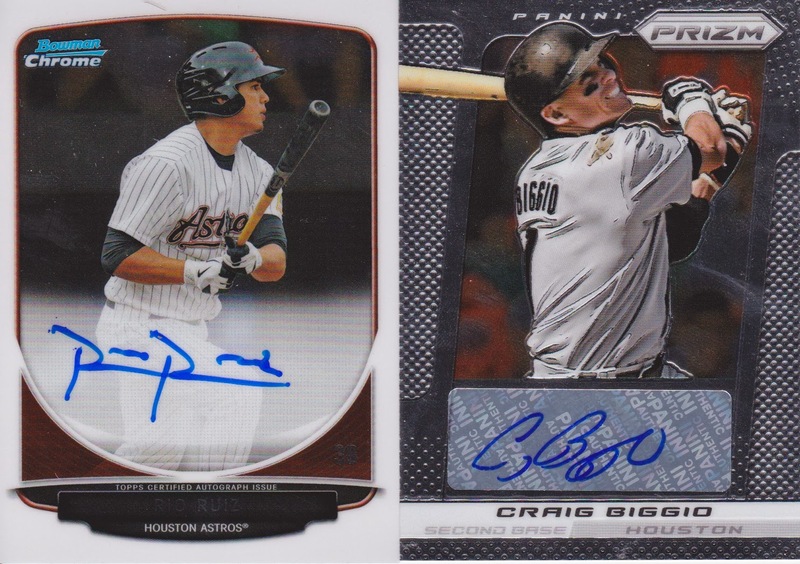 Freakin sweet Biggio Auto /25!!!! 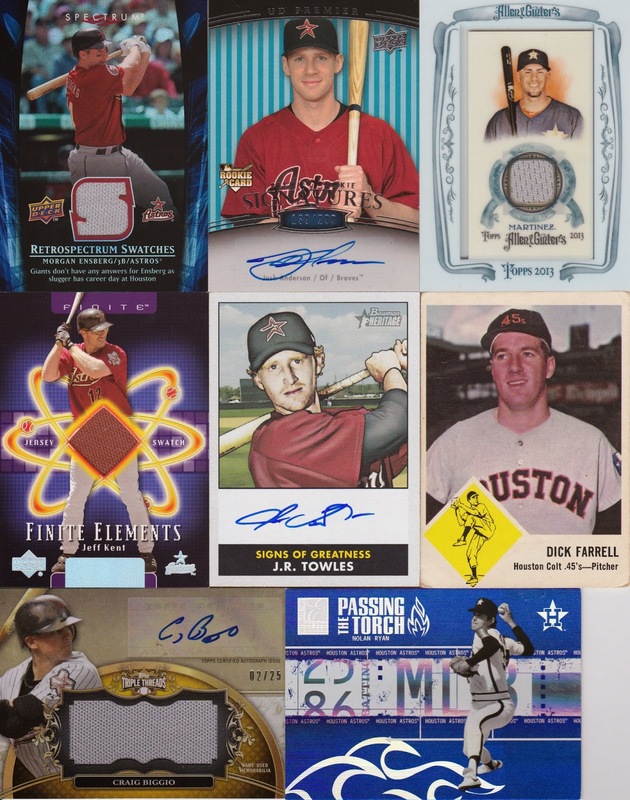 I have a few of these parallels, but was missing the /25 so this is a very welcome addition! Paul, I hope you had an amazing Christmas! Your package ended up being the only cards I got for Christmas and boy did they put a smile on my face! Thanks bud and I hope your Elfster Secret Santa did you a solid addition to your collection as well! 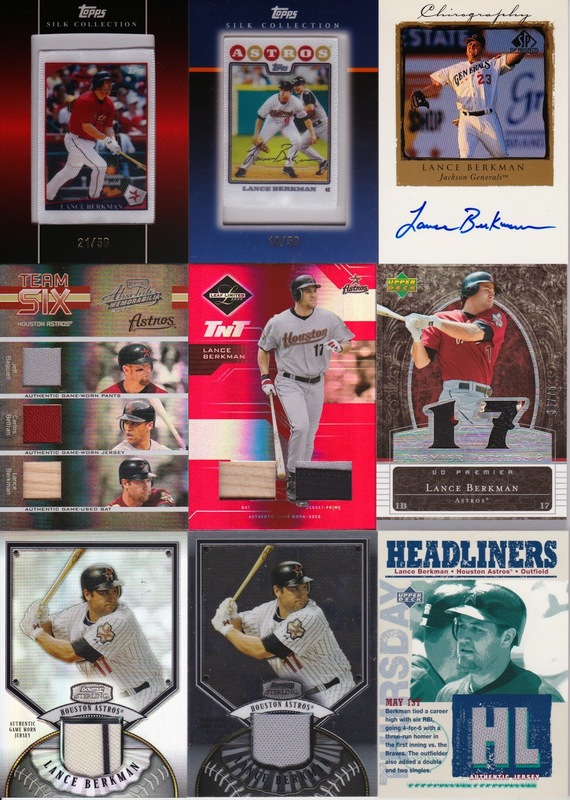 Ok, so when Topps made the grand decision to add Biggio to 2013 Topps Triple Threads, I was all kinds of excited, but I also know that I was going to be screwed because there would be all kinds of base parallels, auto parallels, relic parallels and printing plates to chase... good golly... but I have amassed quite a nice collection in the past few months and I'll go ahead and show off my mostly complete Biggio base card parallel rainbow! 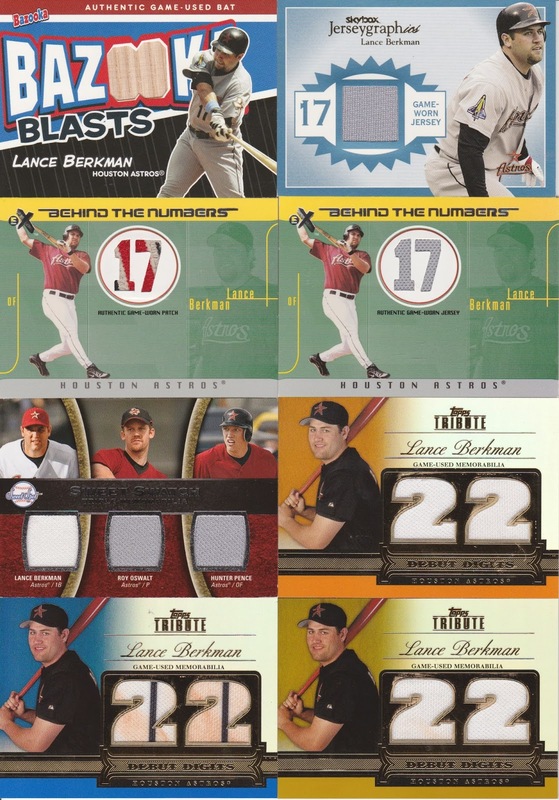 Top to bottom, left to right - 645/650, 76/250, 64/125, 9/99, 29/50, 1/25, base. 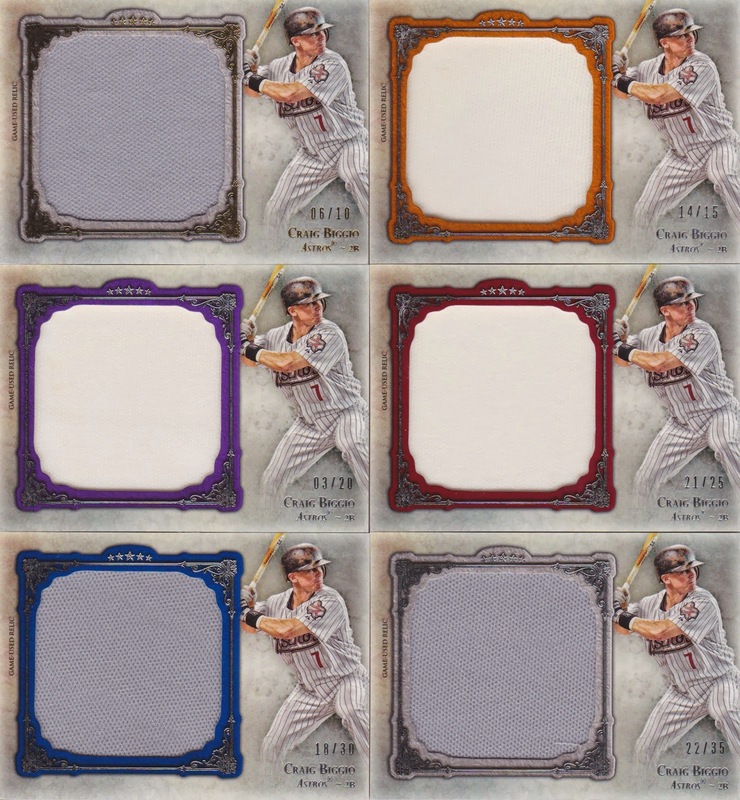 All I'm missing are the printing plates and the 1/1 Ruby parallel. All 4 of which I am fairly certain I'll never see, but I've got my saved searches on eBay primed and ready for them!